This is the first in a new series of blogs that will ask various education figures a few key questions about their own personal curriculum journeys. 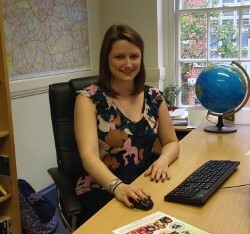 We begin with the wonderful Emma Lennard, now a curriculum consultant. You can find her on Twitter at @emlennard. My mum is a teacher and I swore I’d never do it. I saw how hard she worked! But quite honestly, my university ran an evening course about teaching and you got paid £10 in cash for each session you turned up to. I obviously went to them all! I then did work experience in a local school in Exeter and reluctantly realised teaching might just be the best job in the world. I did school based initial teacher training (SCITT) and the course was brilliant and brutal in equal measures. There were lots of positives, but I managed to miss the point that its what the children learn that matters. Perhaps it was just me, but I was swept up in the whizzy animations I could put in my flipcharts to keep children ‘engaged’. Not an individual moment; it kind of happened over time. I was in my first teaching job, in a state primary in London in 2007, and I was just stunned, and actually a bit disturbed, by how little the kids knew. I’d taught them to read and their writing was really progressing, but they had nothing to write about and no knowledge to help them understand what they were reading. At this point the ‘Trad-Prog’ debate wasn’t on my radar at all – as far as I knew, there was one way of teaching, which had formed all of my training and experience to that point. But I could see that way just wasn’t working for the children in front of me, I was working every minute of the day, but it wasn’t enough. Around this time, I found an envelope on the tube with £1500 cash in. When I handed it in, the owner of the envelope offered me £150 reward, so I popped the amazon website up on my board and told my class to shop! 29 out of 30 children chose a non-fiction book. My classroom was suddenly full of books about dinosaurs, insects, the human body, monster trucks, encyclopaedias and atlases… all along they just wanted to know stuff. I realised the curriculum was failing them. The was already a gap between my class and the class of prep-school children down the road, at five years old, I could only see that gap widening. My class needed the best curriculum I could possibly offer them, and they needed it quickly. My school was very progressive, we had gone down a skills-based curriculum planning route. I read a bit over the summer, but I knew I couldn’t just walk in and timetable geography and history. It’s not that the school was anti-knowledge – knowledge just wasn’t seen as important, the topic and cross curricular teaching was everything. I ended up trying to get knowledge in by stealth. I planned a topic on cricket, on the surface just another fun and engaging topic, but we had the atlases out, we were locating countries, recognising flags, learning capital cities etc. For the first time I had some ambitious knowledge goals and I was determined the children would walk out the door knowing more than when they walked in. I then went to work for Civitas who were writing the UK version of E.D Hirsch’s Core Knowledge Curriculum, exactly what the children I had taught needed. I now work for the Knowledge Schools Trust and we are developing a cumulative, knowledge-rich curriculum from Nursery to Year Six. The children frequently blow me away with what they know, their enthusiasm for their learning and their thirst for more. I wish I’d read Daniel Willingham’s Why Don’t Students Like School? When I was training. It should be compulsory reading for all trainees! Teachers and the children they teach constantly inspire me. A little girl, Daisy, was four years old when I was teaching her some history. At the end of the lesson she gave me a hug and said ‘Oh Mrs Lennard, I love that story, if we don’t learn all this stuff, we won’t be very good grown-ups!’. She reminds me to keep trying to be a good grown-up! Absolutely not, I am at the beginning. I just need more hours in the day. The more I learn through planning a primary knowledge curriculum, the more I realise I don’t know. You are not alone! There are other teachers out there trying to do the same- let’s share what works. Read some Hirsch, read some Willingham and then think about the children you teach. What we do has to serve them. We need to be giving them bags of educational gold, that they are then free to save, spend or share wherever they go.